Saga Go is an Anime Action RPG - side scrolling game by 4399EN which is also the developer of the popular MMORPG games such as Crasher and Raider. Some of its great features are vivid anime side-scrolling, brilliant combos combination, cute pets as companion, real-time PvP, multifarious gameplay, free VIP exp, graft gear and fashion. My journey in Saga Go is just short but filled with many memorable experiences. I have to dwell with time, just to reach several events and Boss raids schedule. By the way, my in-game name is LuxVeneficus. Hardships are worth because every boss raids, I'm second in rank which is I feel very happy because I'm not that rich player that spends too much just to be strong. Online gaming is one of my passion. Since 2007, I've played many online games, especially MMORPG, like Supreme Destiny, GunZ, Tales of Pirates and GunBound. And most of these games are on PC platform. So playing Saga Go is my first time playing online game on mobile. The game only costs me 50 Pesos load (if I'm not mistaken), which is my very first time topping up on an online android game, to avail diamonds with lots of freebies included. And yeah, I'm persuaded by this kind of package because of the good offer. This is part of every games' strategy to attract many users, but this also helps developers in maintaining a game. I've decided to quit the game because some of my guildmates are transferring to newer servers, which I think one of the reason that kills a game. 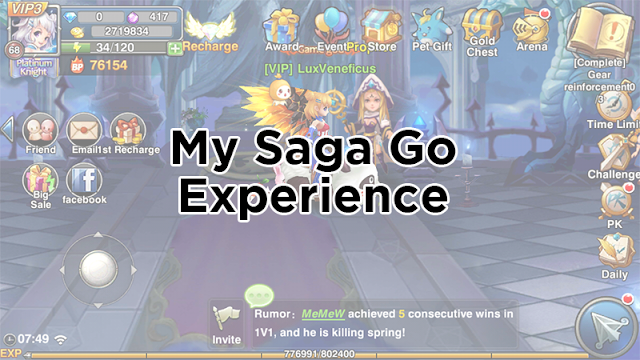 Nonetheless, my Saga Go experience is the best experience I've ever had for an online android gaming. PS: Saga Go server closed on July 31, 2018. It is a sad news but as the saying goes, "All good things must come to an end".